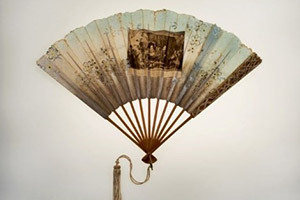 Fan, Embarkation of the Pilgrims, 1875-1900, Printed by Photo Gravure Co., Produced by A. C. Bosselman, New York, New York., Gift of the Estate of Russell J. and Vera L. Wilder, 75.69.99, Photograph by David Bohl. 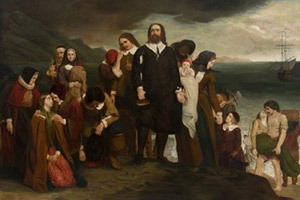 The Landing of the Pilgrim Fathers in America, A. D. 1620, 1868, Charles Lucy (1814–1873), London, England, Gift of J. Robert Merrill, 79.77.1, Photograph by David Bohl. 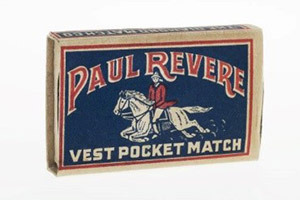 Paul Revere Vest Pocket Match Box, 1920s, Diamond Match Co., Barberton, Ohio, Gift of George Ehrenfried, 89.7.12a-hh, Photograph by David Bohl. Since the 1700s, artists have put their versions of American history on canvas. Enterprising printers duplicated many of these painted images to publish and sell to consumers in the marketplace. Americans’ growing interest in their nation’s story led to a flowering of history painting in the mid-1800s. At the same time, advances in paper and printing technology allowed for more detailed, larger, and more affordable prints. As the United States struggled and prospered, Americans sought depictions of events that evoked national pride or reflected bravery, heroism or persistence—values they admired. Publishers responded to the public’s enthusiasm for American history and its heroes by printing thousands of different historic scenes. 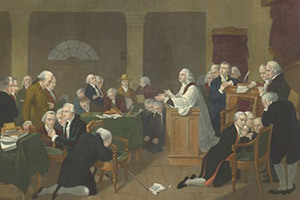 Americans displayed these prints in their homes, schools, and other venues, showing their interest in and knowledge of important events in their country’s history. Today, each painting or print portraying an episode in American history tells a double story of the past—one of the event it depicts and the other of the time it was made. These images serve as rich sources for contemplating how previous generations thought about history-shaping events. When curators began building the Scottish Rite Masonic Museum and Library’s collection in the mid-1970s, they included historic prints among their first purchases. The museum continues to collect them today. “The Art of American History” offers a glimpse into the Museum’s collection of historic prints and the chance to consider the ways in which these images influence our understanding of the past.